For each dip, stir together ingredients in a small bowl. Chill until needed. Preheat oven to 400°F. Toss wings with vegetable oil and five spice seasoning until evenly coated. Lay wings out on a baking sheet, skin side up. Bake wings for 40 minutes at 400°F. Meanwhile, whisk together soy sauce, fish sauce, honey, brown sugar, and hoisin sauce to make a thick glaze. Remove wings after 40 minutes of baking and brush with glaze. Return to oven for 5 minutes. 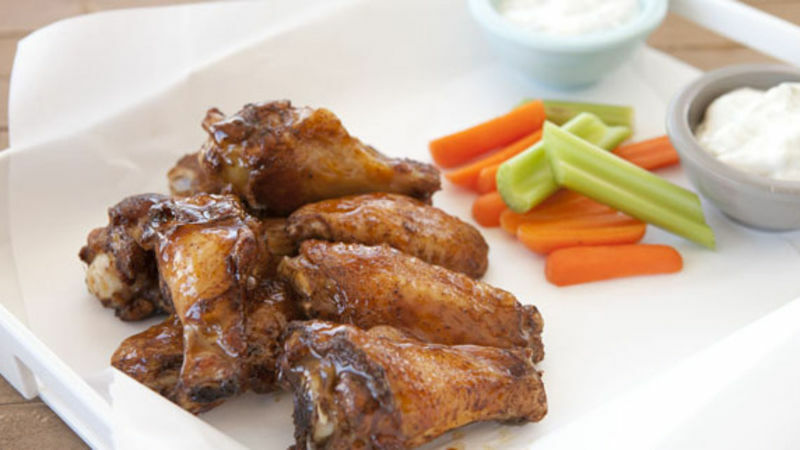 Serve wings immediately with dipping sauces, fresh celery sticks, and carrots. There’s a little sporting event called The Super Bowl right around the corner. Turns out there is some sort of national chicken wing shortage – which is weird because normally they are the cheapest thing in the store. Anyway, you might pay a bit more for your wings for the Super Bowl this year so be sure to do them right! These Hoisin Glazed Wings are not your standard spicy wing. They’re slightly sweet, savory, and really sticky. You’ll need plenty of napkins so you can wipe your hands (after you sneak a few…before you serve them to your friends). I decided to bake these wings so the glaze has a chance to bake on at the end and get really sticky. That wouldn’t really be possible if you fried these guys. Also, baking them gives us a chance to rub the wings with a lot of Chinese five-spice powder. You should be able to find this spice powder in most supermarkets. Feel free to be liberal with it. I like to add a small amount of oil to my wings and then about a tablespoon of spice powder for every three pounds of wings. Toss them together to coat evenly and then lay them out on a baking sheet. Bake these guys at 400 degrees Fahrenheit for about 40 minutes. No need to turn them or anything. Just make sure they are skin-side up and let them bake for the whole time. Meanwhile, you can whisk together the hoisin glaze, which is just hoisin sauce, soy sauce, fish sauce, honey, and a touch of brown sugar. Also, while the wings bake, it’s always a good idea to mix up a few dipping sauces. Blue cheese is standard and I can’t serve wings without it. I also mixed up a yogurt sauce with lots of cilantro and lime which pairs well with the Asian flavors on the wings. Once the wings come out of the oven, brush them liberally with the glaze and return them to the oven for about five minutes so the glaze can get really sticky. Then they’re done! Serve them nice and hot with some crunchy veggies! These are definitely different wings, but they are very addictive. I won’t reveal exactly how many I ate in one sitting, but it was a multiple of twelve! Nick wishes he could be in New Orleans for the big game! Be sure to check out his blog, Macheesmo, and follow him on his Tablespoon Profile.